WASHINGTON — The State of the Union fight isn't really about whether the president can give a speech to Congress. 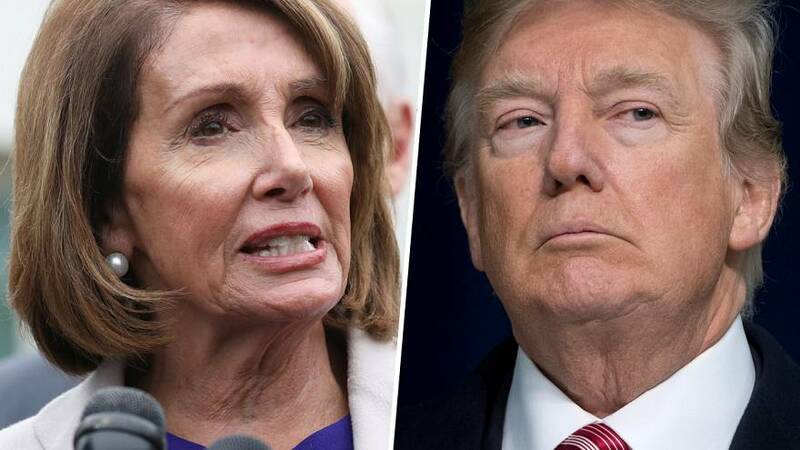 It's just the latest front in a battle between President Donald Trump and House Speaker Nancy Pelosi — one that has implications reaching far beyond the annual address, the prospective $5.7 billion border wall or the very real, record-long partial government shutdown. At its core, the fight is about who controls the agenda for the rest of Trump's first term, and which party is best positioned for the 2020 elections. "Pelosi is demonstrating the power that comes with controlling a chamber of Congress," said Julian Zelizer, a Princeton University professor of history and public affairs. "She is flexing the Democratic muscle so that Trump can see what has changed. ... This is important, not simply because of the current issues, but for the next couple of years." For Trump, who is struggling with that new reality, these intertwined fights have become both a power clash with Pelosi and a test of a core tenet of his appeal to his supporters: his resolve to stand up for them and their values. "It's not about a wall anymore," Charlie Sykes, an MSNBC political analyst and editor in chief of the conservative opinion journal The Bulwark. "This has become a stand-in for the entire culture clash." So far, indications are that he has been failing the test. He still has no wall. His government is in its fifth week of partial shutdown. He has been shut out of the House, where generations of presidents have delivered State of the Union addresses, regardless of personal popularity or political persuasion. His poll numbers are tanking. And his latest gambit — aimed at cracking Democrats wall of opposition to his border barrier — infuriated some portions of his own base. Jenny Beth Martin, co-founder of the Tea Party Patriots, who attended a meeting with Trump and Vice President Mike Pence Wednesday to discuss Trump's plan to fund the border wall while protecting certain undocumented immigrants from deportation for three years, said that her members are mostly still with Trump. "Right now, they're supportive of what the president is doing," she said, noting that they want to give him "the leeway he needs" to negotiate for the wall and other border-security measures. But, she added, if Trump sweetens the pot for Pelosi and Senate Minority Leader Chuck Schumer, D-N.Y., she can't say with confidence now that her group's members would stick with him on that. David Jolly, a former Republican House member from Florida, said Pelosi and Trump should both be looking for ways to reach out to middle-of-the-road voters with a compromise, but are instead locked into the fight because it's what their core supporters want. "In many ways Trump and Pelosi are reflecting the state of play in our politics: base voters control the parties, and compromise is fundamentally seen as weakness," he said. "The opportunity lost for both the speaker and the president is to keep or bring into their tent the restless middle begging for a more responsible government — the voters that arguably put Trump over the top in 2016 and Democrats over the top in 2018." Trump's latest proposal is a move in that direction, as is the House Democrats' new plan to pass a bill that would provide at least an additional $5.7 billion in border-security funds with none of it available for a wall. But it remains to be seen whether either play will attract many votes from across the partisan divide. While the Senate is slated to vote on Trump's proposal and a Democratic plan to re-open the government without money for the wall on Thursday, the cancelation of Trump's address to Congress next week and his remark to reporters that he will announce another venue for the speech suggest that both he and Pelosi think the shutdown is likely to continue for at least another week — while new moves suggest the Trump administration thinks it could stretch on for far longer. The incentive for Democrats to give ground is the 800,000 federal workers who have been furloughed and others whose wallets have been affected by the shutdown — an incentive shared by the White House. But on a political level, Pelosi's approval ratings have risen, and most voters want Trump to re-open the government regardless of whether he gets the wall money. "President Trump views the world as a series of winner-takes-all fights, but life under divided government doesn't fit that model," said former GOP House leadership aide Michael Steel. "The only way to make progress is to find common ground and leave everyone a bit unhappy." Zelizer said the primary reason for Pelosi to stick to her guns is to discourage Trump and congressional Republicans from taking similar action in the future. "Republicans have been increasingly willing to use aggressive legislative tactics to achieve their goals," he said, citing lengthy government shutdowns dating back to 1995 as the most prominent example. "Democrats are less concerned about the wall and the money for the wall than they are with process. By saying no to the hostage-taking process, they are trying to prevent the GOP from doing this again, and the next time with something even bigger on the table — like Social Security." To some extent, Sykes said, Trump already has caved on the wall. He once promised it would be paid for by Mexico, span the border and be made of concrete. Now, he sees it as a slatted steel structure on parts of the border, and he says, in contradiction of most economists, that it will pay for itself in the form of revenue reaped from taxing the profits of U.S. companies that do business with Mexico under the U.S.-Mexico-Canada trade agreement. Congress still hasn't approved that deal, and most economists say that any increased revenue over its predecessor, the North American Free Trade Agreement, will be relatively negligible. But that's all the more reason Trump is boxed into trying to get something he can claim is a wall — and all the more reason for Pelosi to find ways like denying him a State of the Union venue to make it more painful for him to hold out for it. "This is the ultimate test of his manhood," Sykes said. "And we know how Donald Trump feels about his manhood."